May the iron I ride sharpen the iron you ride, Pastor Frenchie? Please pray for all my Brothers and Sisters who will be out and about tonight. Pray for each one’s safe return home. Thanks to all who participated in the SOD/ESCOC Annual Easter Event for the kids, you all did a great job, God’s blessings upon you and yours. "So they set out and went to every village, preaching the Gospel and healing people everywhere". 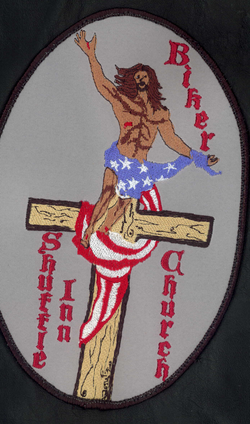 We at the Shuffle In Biker Church find ourselves in a unique position as to what we call outreach. We are called to take His word to the lost and fallen souls of the Motorcycle World. We are a very strong core group of men and women, who have put our faith in Our Lord Jesus Christ, and through this faith we are moving on with the mission that He has called us to. We will be taking His ministry to every Biker Club that will have us.